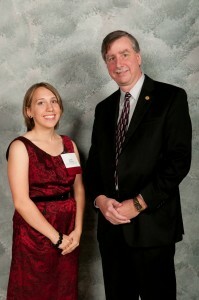 Illinois State scholarship recipient Colleen Kjellberg. Colleen Kjellberg loves school so much that she used to cry on snow days. She’s known she was meant for college since she was a kid, given her favorite childhood memory of her mother reading to her in the back of their station wagon. But as a triplet in a single-parent household, she knew it would be tough. She’s been working since age 14 to save up money for college. So when Kjellberg, a sophomore from Lombard, found out last fall that she won a full-tuition scholarship through the Greenebaum Memorial Fund, it was a powerful moment. It meant she wouldn’t have to take on more student loans, and could catch up and pay off her debt from freshman year. But more than that, it validated her choice to pursue a career in education. Colleen Kjellberg was joined last fall at the College of Education scholarship ceremony for scholarship winners by Department of Mathematics Chair George Seelinger. “To me, it symbolized that I was meant to become a teacher,” Kjellberg told STATEside. Kjellberg is one of seven new recipients this year of the Greenebaum Memorial Fund in Memory of Elisabeth C. Greenebaum, Helen and Jacob Greenebaum, and Henry E. Greenebaum scholarship. Before her death in 2009, Elisabeth Greenebaum arranged for the gift to establish an endowment so she could provide scholarships to future educators, who might not otherwise be able to afford college tuition. Three years later, more than $213,000 has been awarded through 41 new and renewed Greenebaum scholarships, making a big difference for education students like Kjellberg. Kjellberg burst into tears and returned to her students with mascara running down her face. “I was really grateful to have that moment with (my Preview students),” said Kjellberg, who is also a resident advisor. Kjellberg said she’s incredibly humbled by the award and proud to represent the Greenebaum family. Elisabeth Greenebaum’s dream was to get her master’s degree in childhood education at Illinois State, but she decided to move back to her hometown of Pontiac instead to help her family run their bank. The Greenebaum Memorial Fund scholarships are awarded by the scholarship committee of the Council for Teacher Education, which is under the auspices of the College of Education. The scholarship has already made a big difference in Kjellberg’s life. Despite paying off her debt, she’s trying not to let the scholarship change how she behaves or spends money. But she is dreaming bigger. She’s now considering pursuing a second bachelor’s degree before looking for her first job teaching math to high schoolers. And she still has her sights set on a Ph.D. down the road, an important step toward her ultimate dream job of being a provost at a university. The Greenebaum scholarship, Kjellberg says, meant that she belonged at Illinois State—and in education. “It means a lot more than just a check,” she said.